Thousands of years on from that time when cavemen would have first discovered it, the need to start a fire is as strong today as it was then. When you’re out camping it can be essential to start a fire in order to keep warm, cook food and boil water so getting the best fire starter is essential. In order to find the best survival fire starter for you though there are a lot of different aspects to consider and none more so than what type of starter you require. After that there other important considerations such as ease of use, weight, consumption and many more. That’s where this guide is here to help, as we answer all of your questions to ensure that you’re fully informed before making your buying decision. 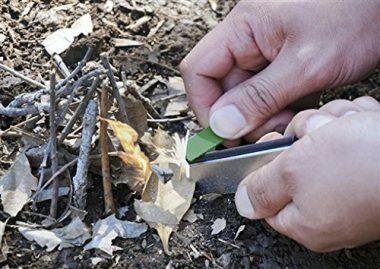 We have also looked through the fire starter reviews to show you the best products on the market so you’re able to choose the top rated survival fire starter for you. 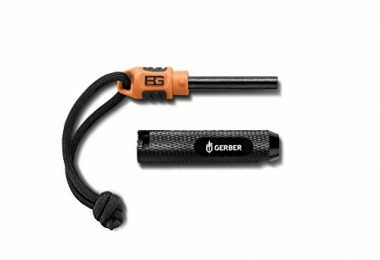 This is a well-designed and ingenious fire starter from Gerber Blades and one of the most highly rated products on the market as it has a long line of great reviews, so you know it’s going to be a quality product, which is endorsed by the famous survival expert Bear Grylls. The design connects together before being pulled apart to unveil the two separate pieces which can then be struck together to create a spark which will help light that fire. The rod is made out of ferrocerium which does the perfect job when combined with the metal striker. The product comes with a lanyard which means that you will be able to easily secure it and keep the two main pieces together. In the lanyard chord as well, there is an emergency whistle which you’ll be able to use if you’re in distress. Overall this is a lightweight and easy to store product which provides everything you need for a quality fire starter. This is another product which uses a rod except for this time it is made out of magnesium in a kit which comes with some great additional extras. The fire starter has a large scraper to connect with the rod in order to make the sparks that you’ll be looking for to create your fire. The rod will be able to work in all weather conditions as it is windproof as well as being water resistant. You will be able to strike the rod 15,000 times before it gets used up so this is a product which is going to be able to last you for a very long time even with constant use. 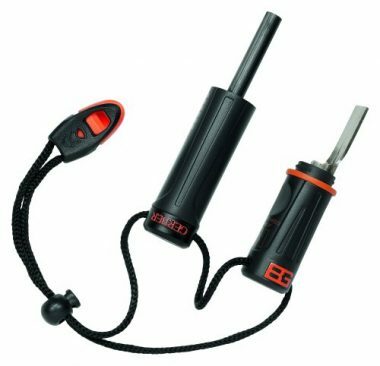 Not only does it have the fire starter but the product also features a compass as well for extra navigation help and there is also a whistle too which can make a sound up to 150 decibels. This is a product which is great to carry around with you and is highly rated by those who have used it. This product doesn’t have a rod which can be commonly featured in these types of products but instead uses a fuel bar which is highly compact and could even be attached to your keychain for highly convenient use. The fuel bar is made of magnesium which can be sparked up using the attached flint. The product is waterproof as well as weatherproof so you’ll be able to use it in all types of situation and still get a very high level of performance out of it. The bar measures 3 inches by 1 so you’ll be able to put it anywhere you want as it doesn’t take up a lot of space at all. It has a single-sided serrated striker which will help you create that spark and it also comes with a few bonus items of a compass as well as a detachable ball chain. If you’re looking for a fire starter which takes up the lowest space possible then this could well be the perfect product for you. This is a slightly different product as InstaFire have created a material which will be able to help you start a fire in even difficult situations and will help you have a powerful fire in no time at all. This is a fuel that comes in easy to store bags which will then be started instantly by a match. This can be great for wet or snowy ground as the natural insulation of the granules will mean that you can light it anywhere and it will stay lit in winds of up to 30 miles per hour. Once lit, a whole pouch will burn for up to 25 minutes giving you plenty of time to start burning logs and branches to create the full fire you’re looking for. The fuel doesn’t leave behind any chemicals and is environmentally friendly giving you a fuel source without the need to carry and propane or liquid. It stores very safely and will provide you with a very quick fire as long as you have a match or a striker with which to light it. 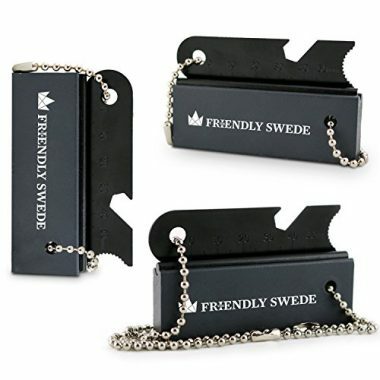 This is another highly compact fire starter, this time from The Friendly Swede which will be highly effective in creating a quick fire time and time again. It works by scrapping off parts of the magnesium fuel bar and then using the striker in order to light them. This will work in any conditions so you’ll never be left without the fire that you are looking for. 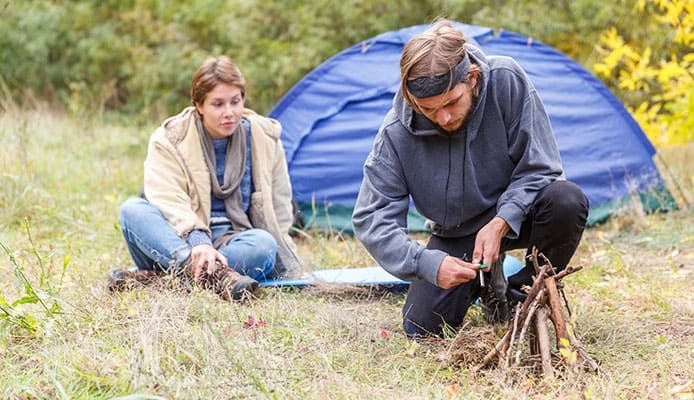 This will allow even the most inexperienced of campers the ability to start a fire such which shows how easy it is to use the product and it’s a fire starter which is going to be able to last you for a long time as well. A little added extra to the striker as well is a bottle opener too so you’ll never be caught short without a tool to open your drink. Its quality has a lifetime guarantee so you know that you’ll be buying a quality product and one which isn’t going to let you down. 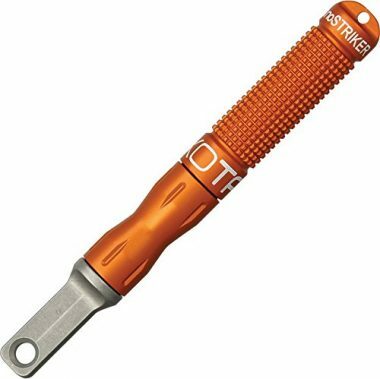 While style might not be something that you immediately look for when it comes to a fire starter, it’s always nice to have things that look great and this product from Exotac ticks that box. Not only does it look great but it’s also available in four different colors as well of orange, black, gunmetal and olive. This has a rod which is made out of ferrocerium which will be able to easily help to create that fire and the device is very compact so it could easily fit into your pocket or a key ring. The rod is replaceable and will work while it is wet too so you don’t have to worry about the conditions. It will be able to start up to 3,000 fires even with its small size and is a collapsible and self-contained product. If you’re looking for a compact ferrocerium product then this would be ideal. It won’t let you down and is another product which has a long list of happy customers. This is another product which will require an external fire such as a match but will give you a long-lasting burn which will help you to get that campfire roaring in no time. They come in a pouch which lights very quickly and will be able to burn for 10 minutes at over 750 degrees. The pouch is non-toxic so you won’t be damaging the environment by using them and they are also waterproof as well so they are going to be able to work even in bad and difficult conditions. While they are great for campfires they can also be used for fireplaces, bonfires and stoves. Once you have lit this pouch then you will be able to place branches and logs on top which will be able to build up your fire in no time. All you need to do it carry some matches or a lighter with you and you’ll have the fire you need without having to spend a lot of time building up your fire. This is an innovative product from UST which can be used with just one hand which make it very easy to use. It has a flint-based Firestarter with a ferrocerium rod which will be able to generate a very hot spark which will be three times hotter than an ordinary match. The hot sparks can be directionally targeted and there is a safety button in the cap which will be able to prevent and accidental sparks from happening. All you need to do is create some tinder and then this fire starter will then be able to light it in no time. It will be able to create sparks in any conditions so you don’t need to worry if you’ve been in a little bit of rain. The flint bar is able to rotate 360 degrees so you are able to get even use out of your Firestarter and the fire starter will be able to last up to 4,000 strikes. This is another great product from UST which can be used with just one hand so that you have that ease of use. The product is both light and compact so you’re going to be able to store it anywhere in your camping equipment which makes it ideal for ultralight backpacking. This will be able to spark up a large range of tinders as the sparks will get very hot and can even be generated in the rain or any other difficult weather conditions. The flint-based bar is going to be able to work for over 100 strikes so you’ll be able to create many fires with the device. It has a durable plastic coating which is going to be able to stand up to a lot of wear and has a great design as the flint road is able to collapse back into the case which helps with its compactness. It only weighs 0.8 ounces and has a limited lifetime guarantee. This is another product from Gerber with is endorsed by Bear Grylls but this is a very compact device which can easily be taken with you to anywhere that you wanted to go. The fire starter has a simple 2-piece design which is able to create your fire incredibly quickly. The product comes with a lifetime warranty so you know that you will be getting a well-made product which isn’t going to let you down when you need it. The clever design will be able to keep it secure in all conditions while also giving you quick access whenever you need it. It comes with a cord lanyard which means that you can easily attach it to a keychain, your backpack or even one of your zippers. The fire starter is only four inches long and only weighs 0.8 ounces so you’ll barely even know that you’re carrying a crucial piece of camping equipment. Before you buy your fire starter it’s important to know what type of environment that you’re going to be in and the weather that is going to be around. This can obviously have a huge impact on your ability to build fires as any damp or wind can heavily affect a fire’s ability to perform. While you may see a product as notice that it says it’s ‘waterproof’, that might not always mean that you are able to start a fire when it’s raining. That’s because some products require you to make your own tinder in order to start a fire. If you’re trying to start a fire with a ferrocerium rod then you might have difficulties with that as even the bright hot sparks might struggle to create anything if the tinder was damp. This could probably be done but it’d take a more time and effort than you’d hope it would. In damp situations it’s probably best to take a magnesium fire starter with you as this would mean that you are able to have a ready-made tinder there which is going to be able to be lit in wet conditions. The problems with the flakes that come off a magnesium rod though are that they can be easily blown in the wind until they are lit. 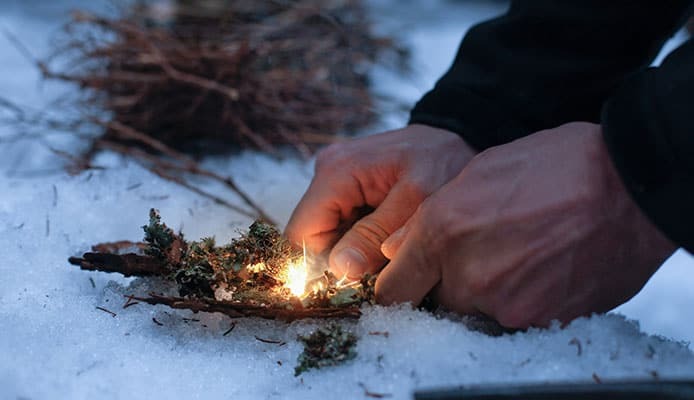 There are other options too such as a pouch which will be able to be lit and then used to help create a fire but require an extra lighting measure such as a match. It’s clear then that you have to match the situation that you are in and check your environment. Of course it is probably asking too much to have every single type of fire starter but if you’re constantly going to be camping in a specific type of environment then it makes sense to get the fire starter which most closely matches that. Sometimes you need additional material with which to start a fire or help you along the way. If you have a ferrocerium rod for example then you might struggle to make a flame if it has been raining as you would have to search for some tinder which is dry enough to light. This can be very difficult so bringing along something like a few cotton balls for example might be a good idea as these act as good tinder while to start to work on creating a bigger fire. One good tip is to apply a petroleum-based jelly to the cotton ball which will help it to burn hotter for longer. There are other things that can be used to help create a lasting flame such as an alcohol-based sanitizer and sometimes you have to be creative if conditions aren’t ideal. If making fire is going to be a crucial part of your trip then taking matches and some fire starter pouches might work as a great backup should something go wrong. Whenever you’re taking gear with you it’s always important to put it in the most convenient place and sometimes the order can be confusing. You need to pack your bag efficiently so you are able to get to your vital items straight away and don’t have to go rummaging through gear that isn’t essential. With your fire starter, this depends on how often you aim to be using it. It could be that you’re at a camp which is going to have a gas grill and you want to carry one in your bag just in case of emergencies or it could be that you intend to use it every day and therefore you need it as close as possible. 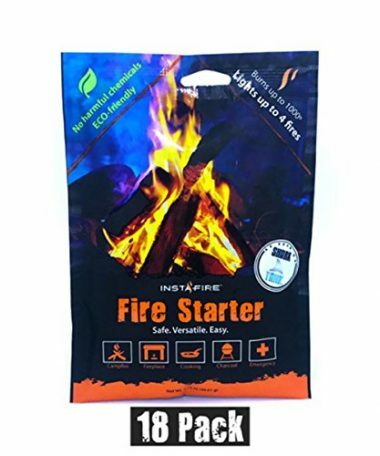 A lot of these fire starters are highly portable and can easily be placed in any pocket of your backpack or it can even be tied to the zipper on the outside of your bag. If you really want it in an emergency and are worried about losing your backpack then there are fire starters that you can wear around our neck or simply put on your keychain. The whole point of getting a fire starter is for the ease of use. Unless you want to start learning how to create fire the way they did it thousands of years ago then you’ll want a fire starter which is going to be able to get a fire going quickly and efficiently and without much fuss. Most of these products are very well-designed and have a very simple system of striking one thing next to another in order to create a spark. If you’re using magnesium then this has some advantages and disadvantages when it comes to ease of use with the advantage being that you don’t have to worry about finding tinder as you’ll get that from scraping off the magnesium. Not only does scraping off the magnesium take time, but it also produces delicate flakes which can easily be blown away and can be very frustrating. This is where striking against a ferrocerium rod though can be really easy as in dry conditions the intensely hot sparks can get a fire going very quickly but in more damp conditions you might have to spend more time striking it until it lights. Away from their primary job there are other aspects of these products which can add to their ease of use as well such as having a handle which is easy to grip and a product that you are able to use single-handedly. Some have added features too such as a compass or a bottle opener which can make them a highly convenient product. Ease of use is something that is very important for these types of products and all the one that he have looked at are well-designed but you also have to look at the situation that you’re going to be in so you can determine which type of fire starter is going to be the easiest to use in each situation. With the main types of fire starter that we have looked at here, there can be a lot of confusion about what each product means and the role that it does. One of the key things to clear up is what is meant by the word ‘flint’ as often this was used to accurately describe a piece of hard rock which was then struck by a piece of steel in order to create a spark. The problem here is that ferrocerium is often described as flint but will produce a significantly hotter spark than the traditional flint fire starter would. If you see a product described as this then you need to double-check that it is what you are looking for. Flint and steel are able to create a spark whereas ferrocerium and steel will be able to create a much more ferocious one. Then you add magnesium into the mix as well, as this is a material that can be scraped off in order to create tinder which will then be ignited by a spark. To confuse things further, this can be done via a few different methods as long as a spark is created. To try and simplify it, you have two options of either striking a ferrocerium rod on your own tinder or striking a rod onto magnesium flakes. Both these methods are great at starting fires so it’s a case of working out which one is going to be the best for you. 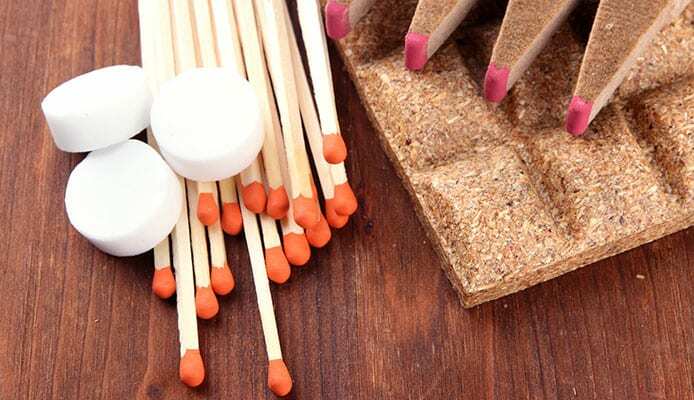 Of course there are other fire starter methods out there as you can just simply take matches with you or a lighter. Sometimes though it can be hard enough to light a candle or a cigarette with one of these options so starting a campfire would be extremely difficult. If you are carrying one of these then it’s a great idea to bring along a fire starter pouch which you can then ignite and will give you a burn time to then start a fire. Whatever the type you want to use, you just need to match it to your situation and work out what your personal preference is going to be. 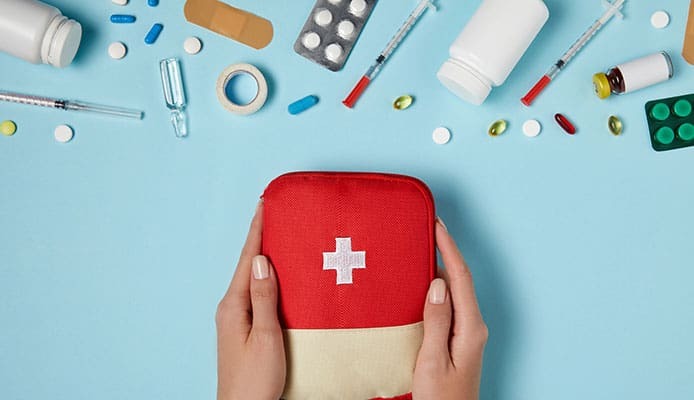 Sometimes it can be a great idea to carry two different options just to ensure that you have all bases covered and maybe have one on your person and one in your backpack just in case any accidents happen. If you’re looking for a fire starter then it’s most likely going to be because you’ll be doing a lot of backpacking and therefore weight is going to be of significant importance to you as you aim to keep everything as light as possible, while the difference of a few ounces might feel small, all those ounces that you save in your backpack and add up to a significant weight. This is also the reason that you might be looking into an alternative fuel source as carrying any propane for a burner would take a lot of effort, as would bringing any charcoal. Having a fire starter allows you to have a little device that you will be able to use at any time without it weighing you down. Some fire starters are bigger than others though and you might want to look for one that you can attach onto a key ring or even place it around your neck. Some of the products we have looked at here weigh less than an ounce so it’s going to be a very lightweight option. If you’re not going to be doing as much backpacking then this isn’t going to be as much as an issue. Weight is related to bulk in many ways but just because something is bulky doesn’t mean it weighs a lot and just because something is small it doesn’t mean that it’s going to be light. When you are backpacking it’s important to consider how bulky your items are going to be and exactly where they are going to go. If you want to start a fire in order to make food then another alternative would be to take a portable grill with you. If you’re going to be backpacking though, even a portable gas grill is going to be highly inconvenient to take around with you everywhere that you go. Other options are going to be more difficult to carry too which makes these types of fire starters even more attractive. Most fire starters are very low bulk so will be easily carried to wherever you need to be. 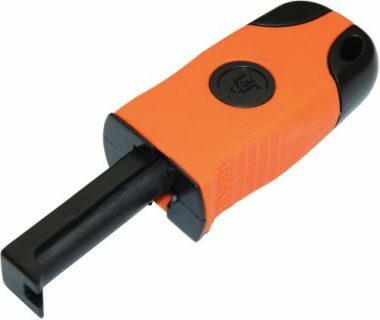 Some have a lower profile than others though, so if you’re really tight for space then you will want to get one with the lowest possible bulk and a 3X1 inch fire starter would be ideal for you. It seems like an obvious statement that a product which is made out of rock or metal is going to be waterproof but when you see this in relation to a fire starter they are not talking about its ability to let water through it but are instead talking about whether or not it works in the wet. As most people know, friction causes heat. You might have seen it in movies or those survival programs where a person is spinning one piece of wood into another in order to generate heat which they can then use to start a fire. Doing it with two pieces of wood though is a lot harder than creating a spark between rock and metal. Due to the two hard surfaces, the friction will quickly generate a lot of heat and therefore burn away any damp that is on your fire starter. This is why almost all of the products will be able to claim to be waterproof as it doesn’t take a lot for the two surfaces to generate heat. If it is damp though, it’s still important to find some dry tinder, otherwise it’s going to be very hard to start a fire. These fire starters generally work by one thing striking against another, so it makes sense that it’s going to wear out over time. A ferrocerium rod is quite durable and there is a good chance that once you buy one, you’ll use it for life. If you are a heavy user of your fire starter or get a compact model though, then this might wear out very quickly. One of the downsides of relying on a magnesium rod is that you’re constantly scraping away from their surface which means that they aren’t going to last for as long. Taking spares is a possible solution as then you know that you’ll be able to find a replacement should anything happen to your existing fire starter. Whatever means you have of starting a fire, it’s clear that consumption is going to be an issue whether that is with lighters, gas, fuel or matches. In relation to those options, using a rod fire starter is going to be one that doesn’t have a fast rate of consumption meaning that you can use the same product for a very long time. Whatever fire starter you’re using, you want to make sure that it’s compatible with what you are doing and what you are trying to achieve. If you have a backpacking stove then it’s not going to be wise to try and use a ferrocerium rod to start it. Equally, it would be foolish to take matches onto a trip if you think that they’re going to help you start a campfire in wet and windy conditions. 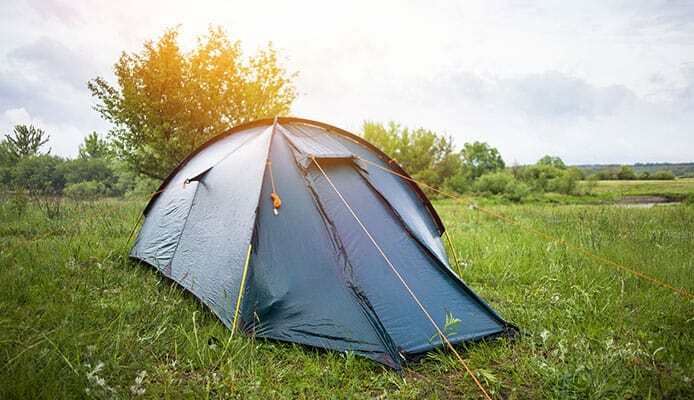 This is all about taking a common sense approach to your camping experience. Once you have made that choice then it will be much easier to do whatever you wanted to do and have a safe and easy camping trip. Not only do you need to know your fire starter but you also need to know all your equipment and work out what it needs to get going. If you’re using a traditional flint and steel fire starter than you are going to find it very difficult to start a fire, this is a method that has long overtaken by other methods of starting a fire. This is because starting a fire with just sparks from flint is very difficult unless you have tinder which is highly flammable with only just a few sparks. One material that is highly flammable with just a flint and steel is magnesium so if you have a magnesium rod then this is going to work to start your fire just because of how easily those magnesium flakes are going to ignite with just a few sparks to get them going. If you have dry tinder though then the quickest method of starting a fire would be with a ferrocerium rod as the red-hot sparks that come from it are going to light a lot of tinders which makes it a great option and it will work in any conditions as well. The only downside to this is finding that dry tinder after it has been raining. Of them all, the ferrocerium rod is probably going to be the one that gives you the greatest results for most of the time as you don’t have to worry about shaving off those magnesium flakes and can just get the fire burning straight away. Another option is using the fire starter pouches and while these can be effective, they’re also liable to not work if they have been subject to a bit of wet and this can obviously affect matches too. One great thing about a ferrocerium rod is that you can drop it in some water and will create sparks a few seconds later. Q: How Do Fire Starters Work? A: Fire starters work in the way that they have for thousands of years where two objects create friction on each other which then generates heat which can then be used to generate a flame. In respect of most of these fire starters, that is a piece of metal striking against a piece of flint or ferrocerium in order to create a spark. This spark then needs to go onto to some tinder. If you have a ferrocerium rod then this will be onto any tinder that you have collected and if you have a magnesium rod hen this will be scraped from there. These are both methods where all you have to worry about is carrying your fire starter kit and you don’t have to worry about any gas, charcoal or propane. Q: Is There An Age Limit To Buy And Use A Fire Starter? A: In all 50 states a minor is allowed to buy a fire starter and with good reason. At the end of the day this product is simply a few blocks of metal and rod. There isn’t anything too dangerous to is and it’s not as if it can be used as a weapon so there is no age limit. Creating a fire in such a way can take and patience so you don’t have to worry about them being in the hands of minors. In fact, it could be a great learning experience for them to start their own campfire and get more experience with being outdoors. Q: How Can I Tell That A Fire Starter Kit Is Reliable? A: Whenever you buy a product you want it to be reliable and that is no different went it comes to a fire starter. If you’re out there in the wilderness and can’t get a fire going, then it can be a huge problem as you could be left without any food, warmth or water. Thankfully these types of products are highly reliable as there is not a lot that can go wrong with them. Obviously all products aren’t created equally though so it’s important to check those customer reviews to ensure that other people have had positive experiences when using it. Q: Are Fire Starters Safe To Use In Closed Spaces/Shelters? A: If you’re using a product which creates sparks then the answer to this question is going to be a no. The sparks from a ferrocerium rod are extremely hot and if they got in contact with material such as your tent then this could easily burn it. The answer to this question is more about whether or not you should be creating sparks near any flammable equipment. If you were in a cave or some other space where there was no fire risk then this isn’t going to be as much of a problem but you need to know common sense and realize just how hot those sparks can be. 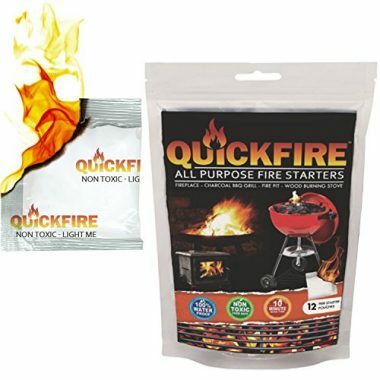 Q: How Long Does A Fire Starter Kit Last For? A: A ferrocerium rod is going to be able to last you for a very long time as they don’t wear away very easily. The exact amount of time they will last for varies from product to product depending on the thickness of the rod and how often you need to strike it. These types of rod though are going to last you for a very long time. Magnesium rods don’t quite have the same level of level of longevity as you’ll obviously be scraping off the flakes in order to start your fire but you’ll still be able to get a lot of use out of them before you have to replace it. Other fire starters such as the pouches are a one-time use product so you’ll be wanting to take a few with you if you consistently wanted to start fires. Q: Will A Fire Starter Kit Work When It’s Raining Or Wet? A: One of the greatest things about having one of these ferrocerium or magnesium products is their ability to be able to strike up a strong spark even when it’s raining. If you are in these types of conditions then the fire starter isn’t going to be the problem but your tinder might be. You still need to make sure that your tinder is going to be dry enough for you to be able to light it. With a ferrocerium rod it might be wise to bring something like cotton balls onto your trip and if you’re using magnesium filings then you need to ensure that they are well protected from any wind so they aren’t blown away. Q: Should I Spend A Lot On A Fire Starter? A: Another great thing about these products is that they are relatively cheap so you don’t have to worry about breaking the bank in order to buy one. You still get what you pay for though and in paying that little extra you could well get a product which is easier to use and has more features. Due to the cheap nature of the product it can sometimes we a great idea to get more than one fire starter so that you always have options available to you. You could combine one of the more featured models with one of the simpler models and store them in different places or between your group so you know that nothing can go wrong. Creating a fire is at the heart of most camping trips and using fire starters which will be able to do the job quickly will often make your camping trip a much more enjoyable one. All the products that we have looked at today will work perfectly as a backpacking fire starter as they are all light in weight and have a low profile as well. 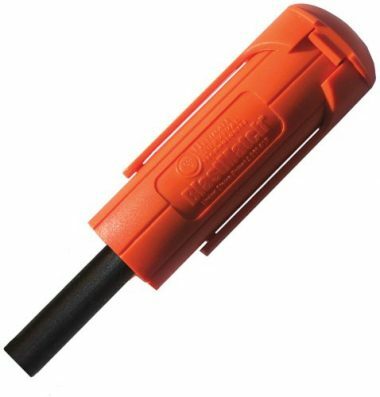 If you’re looking for a waterproof fire starter then any of the rod types of fire starter would work perfectly as the friction of the rod would soon burn off any damp that it might have. A fire starter kit will be able to create a spark in any type of conditions so you don’t have to fret about the weather. 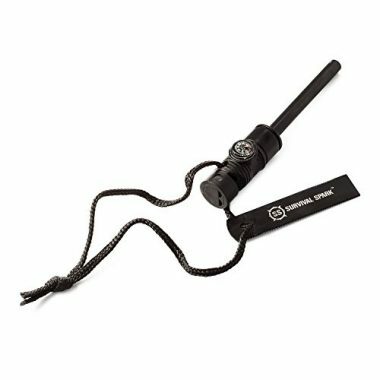 Whether you’re just looking to create a campfire at the end of a day or you are looking for an emergency fire starter, these products will be ideal for both circumstances as they will be able to quickly start any fire as these fire starting tools won’t let you down even in a harsh environment or in damp conditions. Choosing the best product for you means taking a lot of things into account such as the type which we went into detail before as well as the weight and size of the product. You need to match your fire starter to your situation and your environment so you know that you’re always getting the best results time and time again. It might also be a great idea if you’re in a group for different people to have different types of fire starter. Once you have chosen the best product for you then you can head out onto your trip in confidence knowing that whatever happens, you’re always going to make the fire that you need. Hopefully this buying guide has given you all the information that you need to you know exactly what you are looking for so that you can order that backpack knowing that you have the top rated survival starter kit for you.